Are you a new team leader using the AgriSync app? We’ve got you covered with tips and resources for you to easily spread the word about AgriSync to your team. This document contains all the facts and company information about AgriSync. It’s a simple go-to sheet that can be shared when presenting to your team or working the details into a conversation. We’ve included a pre-made email to send out to your company. It’s ready for you to insert names, add your signature, and push send. We’ve included important links to videos and our website to ensure little to no confusion for any team member. This is a PowerPoint template for you and your team to customize as you wish. Add your company logo, profile pictures, and more. Print these off and post around your business as fliers or take them on the road when working with customers. No need for your team to do any marketing. Not sure how to share AgriSync with your farmer customers? No big deal; There are email and social media templates included in the advisor toolkit. Send the email and post pre-made text to your company or personal social media sites. Find the button at the bottom of the AgriSync home page. 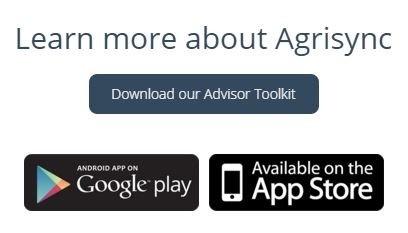 Once your team is aware of the AgriSync app, follow these simple steps to get signed up. Invite your team by entering their cell phone numbers on your company desktop dashboard on the AgriSync website. They will receive a text notification that the team leader has invited them to use the app. Team members can then download the app from the app store. Taking ten minutes now to sign up your team for AgriSync will provide hours of savings and better customer satisfaction this spring. Don’t let your team members miss out on the opportunity to serve customers in a faster, more efficient way. Spread the word! Stay tuned for ways to best share AgriSync with your farmer customers.